I recently stumbled across a new modeling blog called The Combat Workshop. So, anyway, this week’s topic concerns every modeler’s, shall we say, affliction. It is called The Stash. It’s titled Sprue Cutter’s Union 22: The Whole Kit ‘n Kaboodle. 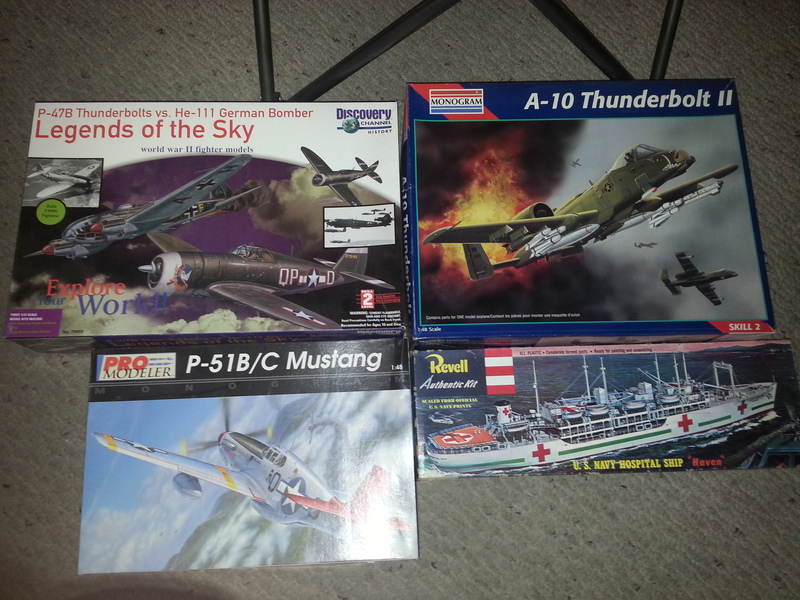 Every modeler has a stash. For those not in the know, a stash is that stack of unbuilt model kits sometimes hiding in cabinets (if there is eminent threat of wrath-of-the-wife,) or sitting on shelves and floor and furniture in the hobby room. Sometimes these stashes can be an indicator of a compulsive buyer. You know, the type of person that sees a kit and thinks “Whoa! Nice Kit. I gotta have it! This will be a great build.” Never mind the fact that there is a huge stack at home bought under the same premise as this one. 1. Lindberg Legends Of The Sky. It contains a Heinkel He111 and two P-47s. My kids got it for me twelve or thirteen years ago when they were wee lads and lass. 2. Monogram A-10 Thunderbolt II. My pop got this one for me twenty years ago. We used to go to airshows together and he was really impressed with the A-10, so he bought a kit of it for me. This is going to be a special build because pop died in 2000. 3. Revell Pro Modeler P-51 B/C Mustang. Bought this one about twelve years ago. It’s actually partially built, but I had to take a break from it to work on something else. It was that or test the impact resistance of the fuselage and wings when hurled at a wood paneled wall at scale three-hundred miles per hour. 4. Revell U.S. Navy Hospital Ship. I don’t really care for ships, but recently found out what troop ship my grandpa came back from Europe on after the war was over, and this kit will replicate it with a bit of scratching. This one came in just today. So, that’s my stash. Quite anemic compared to most, but manageable. Once I get through these, it’s back to my favorite stuff: WWII Armor. Final note: I do have one more kit. It is Tamiya’s old 1/25 scale Tiger I. My brother got it for me in ’87 or ’88. It is supposed to be somewhat inaccurate in some of the dimensions, but that has never really bothered me. It has a rudimentary interior, but I have quite a few reference books that cover this tank. My ultimate goal is to do a full on detailing inside and out once I have re-sharpened my modeling skills. No pic because it is in the shed. My lack of activity has simply been laziness. But, now I feel ready to go, so without further ado, here is my first completed kit since my return to plastic scale modeling. I actually bought this kit in 1988, or so. 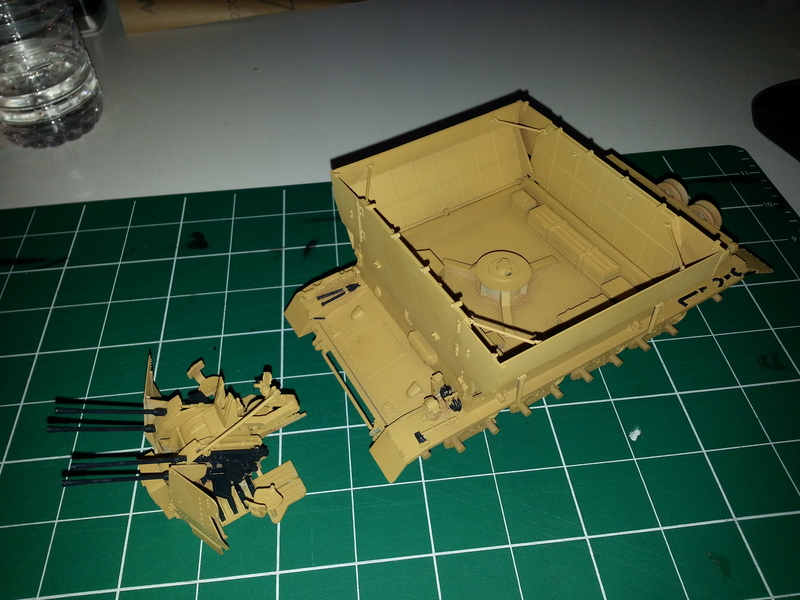 It is The Tamiya MobelWagen Flak Panzer Mk IV. It is an older kit, but seems pretty good. The detail is good and it went together pretty well for the most part. While researching it a bit, I discovered that it was actually a prototype vehicle. 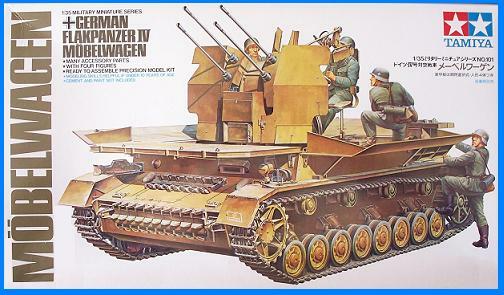 This version and another one with a single 37mm canon as opposed to the four 20mm canons were tried out and apparently Hitler wanted the 37mm version. When I got this kit in ’88 it went into the stash while I worked on other kits. A few years went by, in which time I got married. Modeling took a back seat, and this kit didn’t see the light of day until 2006. I got it out and put a small bit of it together and then it was shelved again. Finally, in July of 2013, I got back into the groove of modeling. I had an area in which to set up a workbench and was finally able to really work on models. 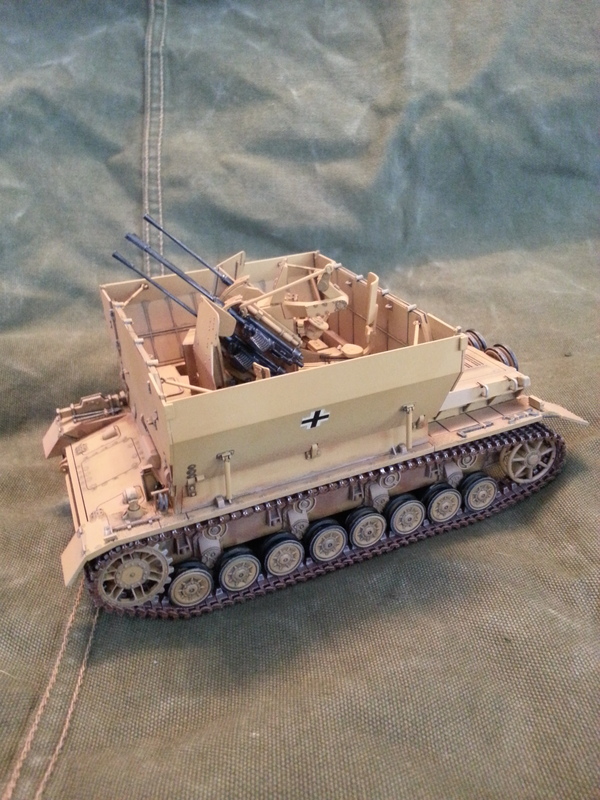 I got the flakpanzer out and finished it up. Since this was my first kit in years I didn’t document very much on the build. However, I did take a couple of photos. The fist one shows the model after completion of assembly and a coat of paint. So, that completes my first kit on the old blog. Next time I will post up some pics of the workbench and the stuff I use for building my kits.